401(k)s have largely displaced traditional defined benefit pensions among private-sector workers, but they are not a major source of retirement income for seniors. 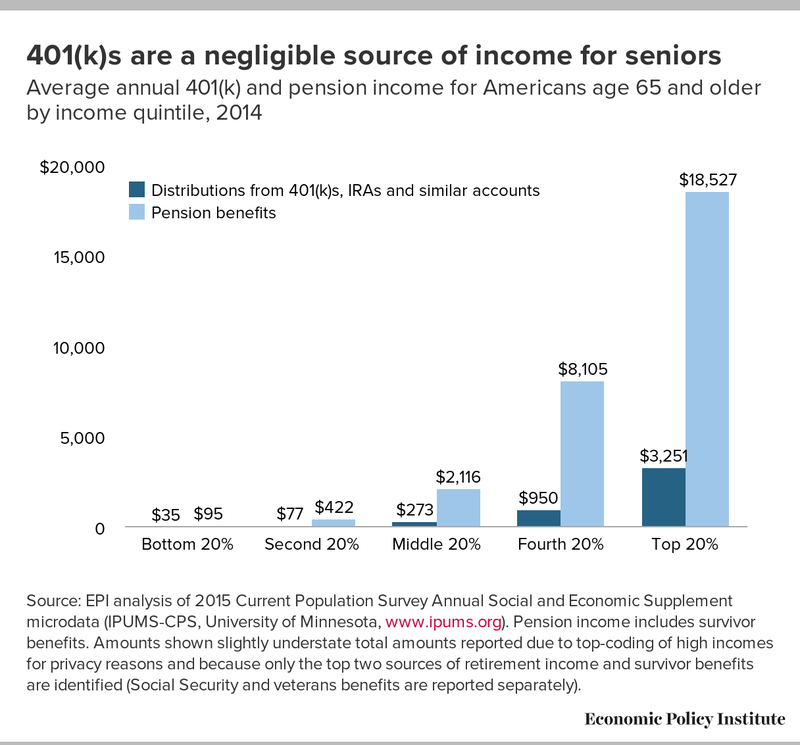 New data show that in 2014, distributions from 401(k)s and similar accounts (including Individual Retirement Accounts (IRA), which are mostly rolled over from 401(k)s) came to less than $1,000 per year per person aged 65 and older. On the other hand, seniors received nearly $6,000 annually on average from traditional pensions. Pension benefits and retirement account distributions are both concentrated among upper income seniors, but far more seniors rely on pensions as a significant source of retirement income. Though 401(k) and IRA distributions will grow in importance in coming years, the amounts saved to date are inadequate and unequally distributed, and it is unlikely that distributions from these accounts will be enough to replace bygone pensions for most retirees, who will continue to rely on Social Security for the bulk of their incomes. Source: EPI analysis of 2015 Current Population Survey Annual Social and Economic Supplement microdata (IPUMS-CPS, University of Minnesota, www.ipums.org). Pension income includes survivor benefits. Amounts shown slightly understate total amounts reported due to top-coding of high incomes for privacy reasons and because only the top two sources of retirement income and survivor benefits are identified (Social Security and veterans benefits are reported separately).